Radiant Dreamer » Meido kuki! I’ve seen it more than once, as some of my other friends have recieved it as gifts before. 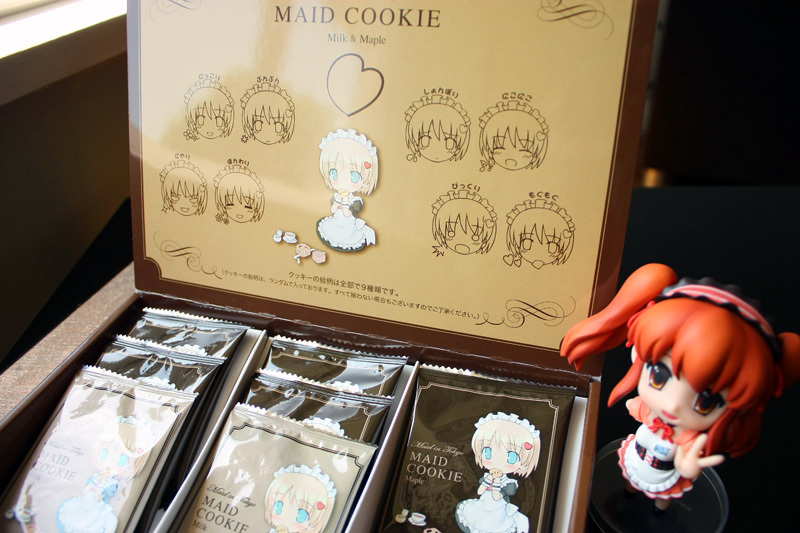 The little maid on the box front is so cute! A close-up of the kawaii meido. 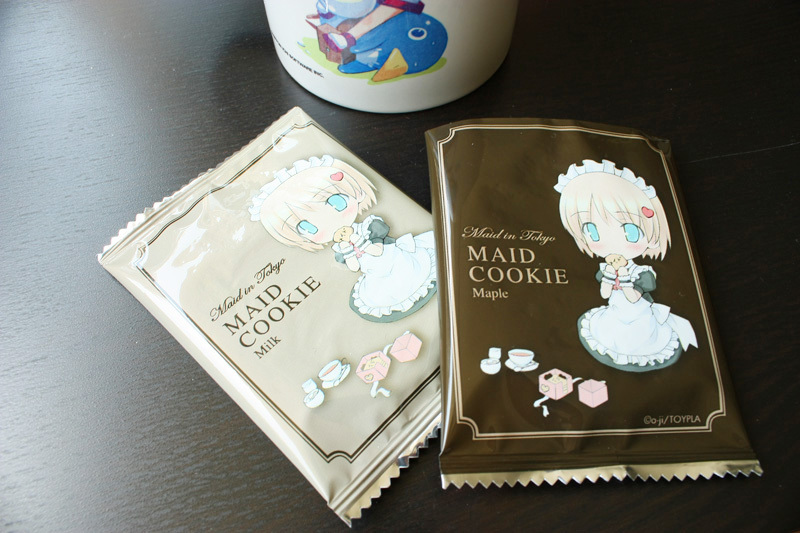 I’m assuming the tiny Japanese characters on the cookie say “Meido”. The cookie box has a flap opening, revealing individually packed delicacies inside. 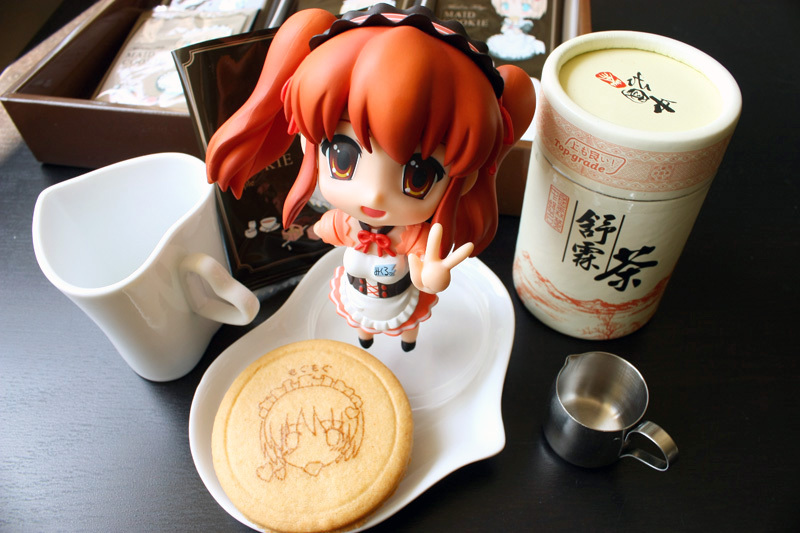 And there’s Mikuru, ready to serve some delightful tea-time favors! 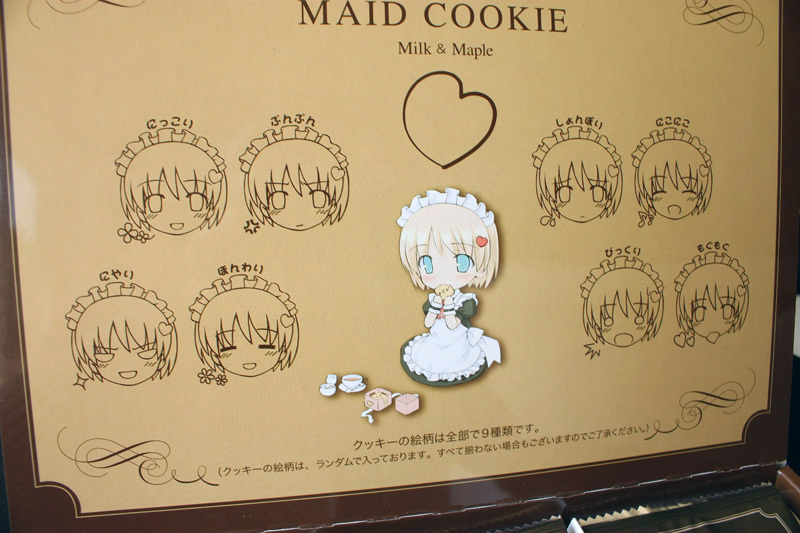 Each cookie has a printed expression of the maid. I have to wonder, who was the artist for this? Why would a cookie company shell out for such a product? What is their target market? Need I really ask? It’s Japan. 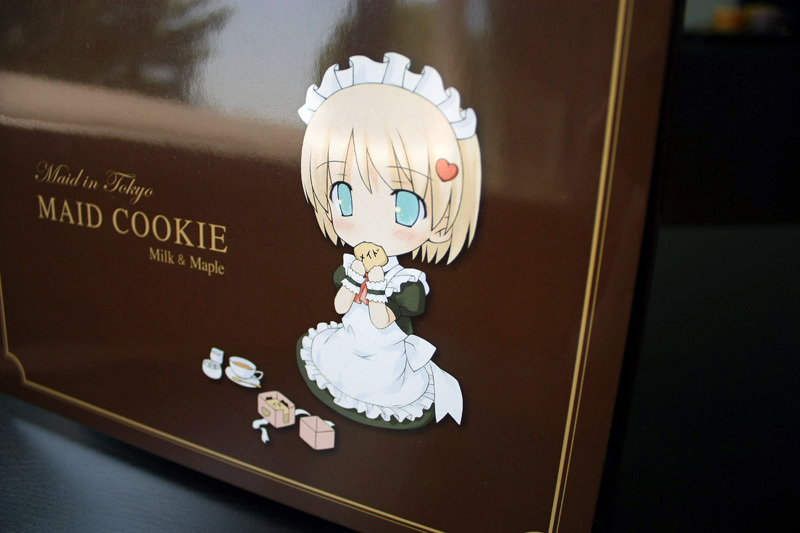 Each cookie is individually wrapped, and comes in either Milk flavored, or Maple flavored. It’s tea time! I hope you enjoy your cookie. I know I will! kawaii! wonder where your friend got it! I want to buy some for myself HAHA! Indeed! It’s so nicely done that I can’t get myself to open a pack to eat it! Eating the one that I took a photo of was such a rewarding treat! 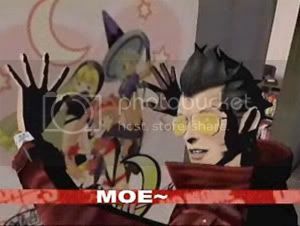 Ya, it says Meido. I want the Nikoniko one! ha haaa that one is the most kawaii! It’s so cute. I wonder how the maple cookies tastes. They taste very good. Well, they taste like regular cookies, I suppose. The maple taste isn’t very strong, but that might be because Canadians drink maple syrup. (lol no we don’t). That is some really awesome packaging for a simple box of cookies. It’s so sleek and shiny. I’m so used to the plain packages you see for Oreo cookies or Chips Ahoy. Japan has so much awesome stuff. 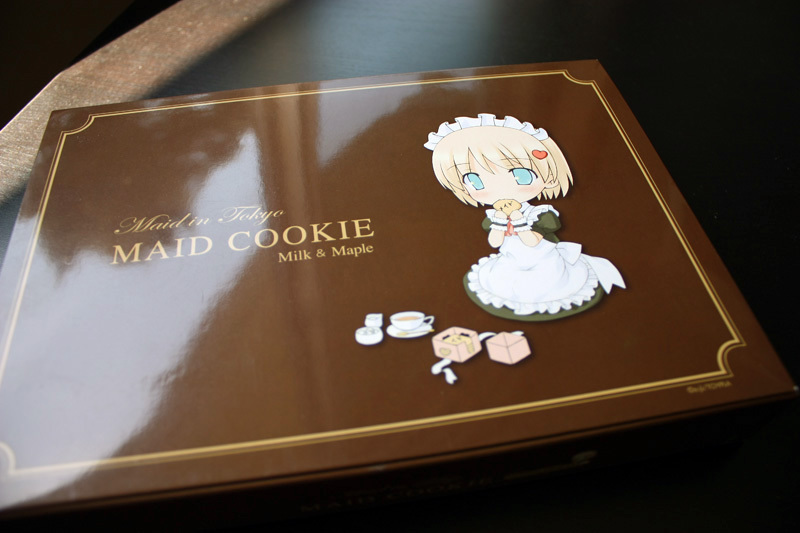 I’m sure I’d go broke just buying novelty food items like the Maid Cookie box. It seems a lot of Japanese products, especially souvenir food products, are packaged this way. It makes me appreciate the attention to detail they put into the presentation of their products, and the importance of aesthetics in their culture. It seems that the Japanese have ALWAYS been obsessed about presentation. As you can observe with sushi especially, of which has been a long time established tradition for them. It’s really interesting to see how presentation and aesthetics have a big impact on what sort of emotions get evoked in reaction to something (like products). well the target market is mostly for otaku right?